Usually, people consider the benefits of using the product they are looking to buy, as well as the utilitarian value of it. Some things, however, are bought with the hopes that they will never be used, and the fire extinguisher is one such product. If disaster hits you’d never want to be caught without one, but even so, no one ever hopes that their house or car will catch fire. Home security is often thought to begin and end by making sure your home isn’t vulnerable to those who have set their sights on your valuables. In reality however, securing your home against the ravages of the elements is just as integral a part of the concept of home security, and fire extinguishers help secure it against the most fearsome of these forces. Water can be an inconvenience when you spring leaks but little more, winds strong enough to do real damage are rare and earthquakes even rarer. Fire, on the other hand, is instantly destructive and frighteningly common. While prevention is always the best defense, it’s always a good idea to be prepared. First though, prospective buyers must understand some basic facts about house fires and which extinguisher is right for their needs. Believe it or not, the first of these is the mere fact that you do indeed need a fire extinguisher. Whether we’re talking about the handheld devices seen in this guide, or built-in fire suppressant systems, very rare is the fire where an extinguisher of some sort is not needed. Simply dumping water on a fire will douse only the smallest flames, and then only if the fuel is certain kinds of material. Some fires just can’t be put out with water, while others – such as burning oil – will become even more dangerous by producing further flammable vapors. Additionally, in most circumstances in order to dump water on a fire you need to get dangerously close. Extinguishers are specifically created to put out flames being fuelled by any kind of material, from a safe distance, quickly. Fires in general are grouped into three categories: A for non-metallic solids (wood, paper, clothes, trash, etc); B for fires fuelled by liquids; and finally C for electrical fires. The material of the fuel is crucial as it influences how said fire can be put out, and not all extinguishers work on all fires. Various methods of putting out fires have been developed beyond the standard extinguisher, such as blankets, however the handheld device which is most common continues to be the most effective solution to this issue. Within home fire extinguishers, there are several types that use different substances to douse flames, which is why some are suitable for some types of fires, but ineffective or even dangerous when used on others. Some kinds, like those relying on air-pressurized water, can only be used on a single type of fire (A, in this case) and be outright dangerous for the other two. Some are more advanced and offer a solution to two of the three types, like foam based extinguishers, which fight both A and B. The best kind of fire extinguisher though, is the universal dry chemical extinguisher, which is great against all three types. While most of the extinguishers we’re looking at in this guide are rated for ABC fires, some are only suitable for one or two types. We’ll take these more limited models first, followed by our list of universal ABC extinguishers. Swinging back to traditional extinguishers is the B441 model from Amerex, another universal fire extinguisher which works against all three types of fires using dry chemicals. Again, keep in mind that this agent can be corrosive, and weigh that in comparison to the versatility of being effective in every situation. Instead of once again bringing attention to the fact that this extinguisher fights all kinds of fires, we’ll look at the B441’s capacity as its main strength. The 10 pound agent capacity is what won the B441 the position of being #1 on our list, as it is the largest universal ABC extinguisher we’ve looked at. While this certainly adds to the weight of the device, when (and if) you see your home ablaze, we don’t think the 19 lbs gross weight of the thing would stop anyone from using it. Plus the sheer amount of fire retardant that fits into this extinguisher makes it capable of dousing just about any fire that would crop up at home, unless it’s allowed to spread significantly. The B441 boasts 20 seconds of discharge and a range of 15 to 21 feet. Both of these stats are the best in their category for universal extinguishers. At this size, the extinguisher uses a hose instead of just a simple nozzle, and the hose on the B441 comes with a muzzle attachment instead of being just a cut-off. The gauge is easy to read so you’ll never find yourself in a situation where you realize that the cylinder has lost pressure at the worst moment, and the pack comes with a metal hook for storage. The device is rechargeable, however this will need to be done at a fire station. The valve is made out of chrome plated brass, which is much more reliable and sturdy than full aluminium constructions, not to speak of non-metal valves. The B441 beats the competition through sheer size. When it comes to putting out fires, almost all universal ABC extinguishers offer the same performance, but the B441 high capacity allows it to be a more reliable choice. Longer range and discharge time are the two factors which really influence effectiveness, and this excels on both counts. 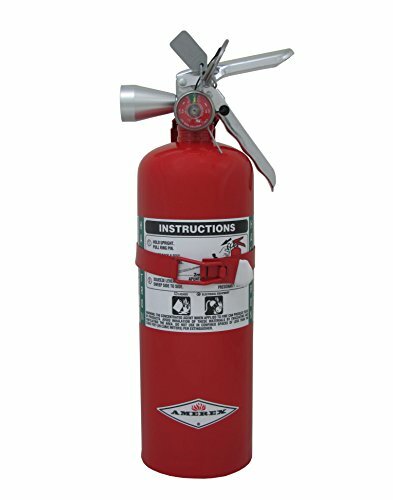 The heavy duty Amerex B441 is the top dog among universal dry chemical home fire extinguishers thanks to capacity and the high quality materials used in its construction. Obviously, these factors come at a larger cost, however you’ll likely only ever need to buy one of these thanks to its rechargability, and knowing that your home and family are safe should be well worth the investment. If you’ve read through all of the previous products we’ve reviewed, you won’t read anything new here. The B402 uses the same dry chemical agent as the other universal ABC Amerex extinguishers, with the same corrosive properties. This model is, like the others, also rechargeable. The B402, with its 5 pound capacity, offers a middle ground between the 10 lbs B441 which we’ve crowned the king of this guide, and the smaller car extinguishers. It is cheaper and lighter than the B441 while still offering a decent discharge time and range. The 5 lb capacity B402 has an all metal aluminium valve construction. With a 14 second discharge time and 18 ft range, this is still a decent choice if you don’t want to dive into the deep end with the twice as large B441. The device has a hose attached, and comes with a metal storage hook in the package. The B402 is a smaller, cheaper variant of the B441 that does the same thing, just less of it. 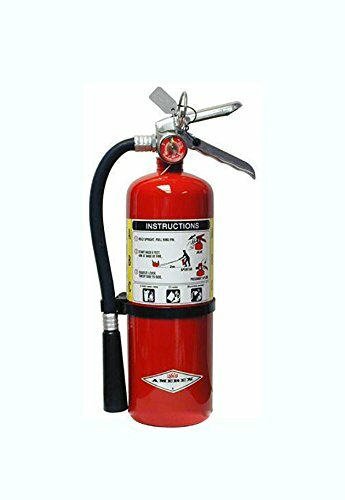 It is a fantastic mid-range solution for people looking for more of a punch than the small 2.5 pound car extinguishers, but don’t want to go for the massive 10 pound B441 heavy duty extinguisher. This next model we’re looking at is something of an outlier compared to the others. As opposed to being a full fledged fire extinguisher, this is a much cheaper and simpler solution designed above all else with convenience in mind, while still getting the job done. 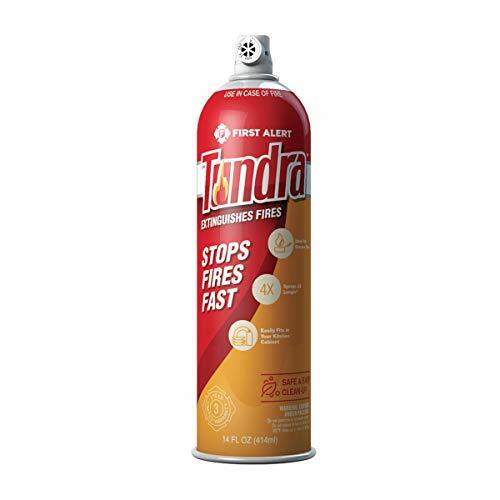 The First Alert Tundra is an aerosol spray can with a fire retardant agent suitable for fighting all three classes of fire. Don’t let the small size and unassuming aerosol delivery system of this product fool you into thinking it’s an ineffective placebo extinguisher. The Tundra has great utilitarian value and works great against fires. When holding a can in your hand, it is understandable that you’d doubt the ability of it to save your family, for example, in an emergency, but a truly effective agent and many reports of great effectiveness back it up. With such a small form factor, this is easy to carry even if you’re on a trip and works almost as well as a ‘real’ extinguisher. The Tundra uses a biodegradable agent, which in terms of environmental awareness is more than a few pegs above corrosive dry chemicals. As an aerosol, the delivery system isn’t as powerful so this will have a longer discharge time than many larger extinguishers in spite of the comparatively tiny capacity, however this comes at the expense of range. The angle of discharge is much wider than in the case of usual extinguishers, so you won’t need to worry too much about aiming, even though the light weight helps in that regard. Again, the cost of this is lower agent concentration, but with a higher discharge time, it should compensate for that. While it is absolutely effective at putting out fires, the Tundra does come with a few downsides which can be attributed to the fact that it is just an aerosol. The short range and low concentration are among these. Additionally, the cans cannot be refilled and have a shelf life of 5 years, with no way to check the pressure and whether there are any leaks. While the First Alert Tundra fire extinguisher can have immense utilitarian value, when it comes to putting out a fire, it doesn’t match the performance of proper fire extinguishers. That said, this little thing is so useful in spite of being so cheap that we’d recommend you grab a few nonetheless, as they’re a great backup choice and can easily solve quickly arising emergencies. H3R isn’t as well known a fire extinguisher brand as Kidde or Amerex, but they do produce a number of extinguishers suitable for various situations. The Performance HG250B is certified for use against class B and C fires much like the Amerex B386T above, though is much smaller and primarily intended for use in a car. The HG250B shares its most notable feature with the model we reviewed just before it – the clean Halotron I agent. This substance is perfectly suited for putting out fires that were caused by liquids or electronics, and while officially only certified for B and C class fires, technically it can help in the case of class A fires. Its performance against these latter type isn’t consistent however, hence the lack of certification. Nonetheless, it is perfectly suited for use on a vehicle, and can come in handy even when providing roadside assistance to someone else who suffered an accident. The capacity of the HG250B is just 2.5 pounds, so don’t expect more than a few seconds of discharge. The range of this extinguisher can be between 6 and 10 feet, which should be plenty for use in or on a car. Whether you’re on the road, or working on the vehicle in your garage at home, the size of this model makes it an ideal choice so long as you don’t allow the fire to get out of hand. The extinguisher comes packed with a mounting bracket and has an all-metal valve, both of which are features shared with the Amerex model we looked at earlier. Another common benefit is rechargeability, leaving capacity and size as the only point of difference. At the end of the day, the H3R Performance HG250B is mostly the same thing as the Amerex B386T, but smaller. Weigh whether higher capacity or smaller size is more important for you, and pick between these two based on that. Universal extinguishers have some obvious advantages, and dry chemical based models (like this one) can do more damage to a car than the fires against which they are used due to corrosion and residue, so keep that in mind when choosing. Stepping into the realm of universal fire extinguishers, Kidde’s Pro 210 model uses a special dry chemical compound to put out flames. As touched upon previously, the advantage of these dry chemicals is that they are effective against all three types of fires. However they are also corrosive, leave residue and can be potentially toxic as well. Keep this aspect in mind when picking an extinguisher. While putting out the fire should always be the primary objective, in those cases when another kind of extinguisher can be used, it’s a good idea to minimize damage. You’ll be reading this often in the upcoming reviews, but the main feature of the Pro 210 is that it can be used on all kinds of fires. This measure of versatility can provide users with a complete sense of security when they have one of these devices on hand should disaster ever strike. The Kidde Pro 210 has an agent capacity of 4 pounds, offering 13 to 15 seconds of discharge at a range of 10 to 15 feet, making it ideal for the extinguishment of larger fires as well as those which burst out of the odd trash can every now and then. It’s rechargeable, but since it’s unlikely that most people will have spare monoammonium phosphate kicking around at home, you’ll need to do this either at a fire station or at an authorized reseller. The Pro 210 doesn’t come with its own mounting bracket, but the pack does contain a plastic hanger for easy storage. The operating pressure of the model is 100 psi, and a small gauge on the valve tracks the internal pressure of the cylinder. However, it definitely stands up to the ravages of time as there are even reports of it being good as new 7 years after purchase. 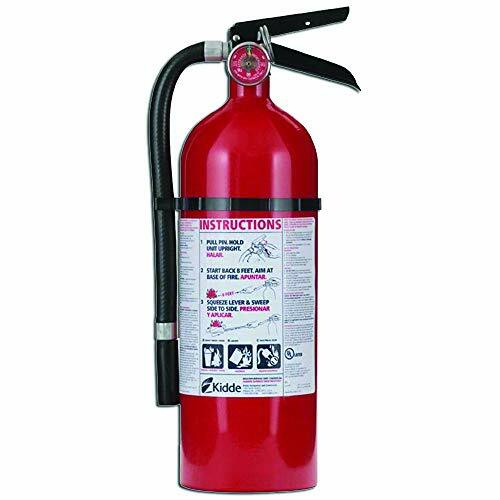 The Kidde Pro 210 is functionally as good as any other extinguisher that uses this agent, with a sturdy cylinder and all metal valve construction. The gauge is a nice feature, however one it shares with many other models that boast a higher capacity, which is something you might want to consider. The B386T is a hybrid extinguisher which can be used for dousing both class B and class C fires (liquid and electrical fires), though it isn’t effective against class A flames (non-metallic materials like wood). 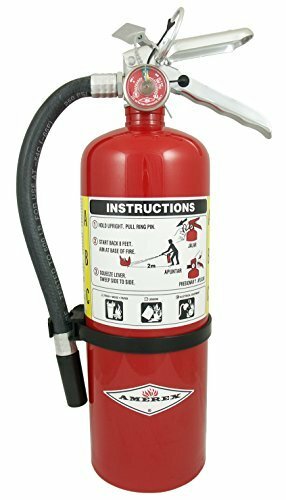 This small, light weight extinguisher is well suited for kitchen or garage use where B and C fires are most common due to many flammable liquids like oils frequently being used, as well as having so many electrical appliances in the same place. With the B386T, Amerex is looking to bring some environmental awareness into the world of fire extinguishers by using an extremely rare substance to put out fires. 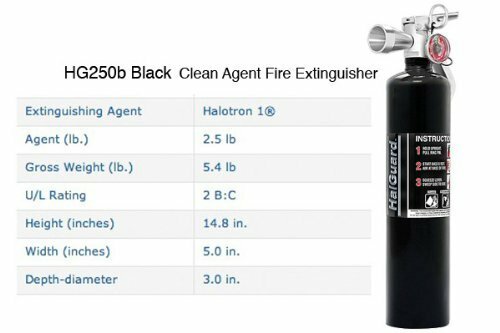 A special clean agent called “Halotron I” which is a non-Ozone depleting alternative to Halon gas, which is the most effective fire suppressant substance. Halon hasn’t been in production since 1994 due to the Clean Air act, though you might still find Halon-based devices on the market since the existing supply is still being used (as this is not illegal). Halotron I carries all the benefits of Halon – namely the complete lack of toxicity and residue – without being a CFC (chlorofluorocarbon), which would damage the Earth’s Ozone layer. 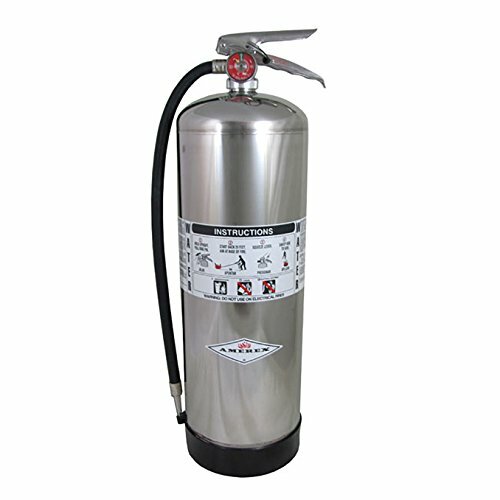 Class B and C extinguishers are typically smaller than those which are also certified for class A fires, as these fires are usually smaller and easier to extinguish. At just 5 pounds, the B386T is a very light device. It has a discharge time of 9 seconds which should be enough to quell small flames, and is easy to use even one -anded, as it has a nozzle instead of a hose. The device is rechargeable, however doing so will require you to head to a local fire station or certified reseller who carries Halotron I and can refill it for you, and will cost around $10. The extinguisher is packed with a vehicle bracket included. The extinguisher has a full metal valve, so you don’t need to worry about it up and breaking on you. The Amerex B386T extinguisher fulfills its role aptly and is a good choice if you need a small device in your kitchen or garage. While not as versatile as ABC extinguishers are, we can recommend buying a B386T as backup, to complement a universal extinguisher, for any situations that arise in the specific room it is kept in. On its own, however, it will not guarantee safety. If you’re looking at buying a home fire extinguisher, Amerex and Kidde will be the two brands that make up around 95% of the market, with very few other brands to choose from. Both have a massive lineup of products filling every niche within this particular industry, and the 240 is Amerex’s top class A extinguisher. In case the name didn’t make it obvious, this model is only suitable to fight class A fires that are fuelled by non-metallic solids (things like wood, paper, cloth and trash). Without a doubt, the strongest aspect of the Amerex 240 fire extinguisher is its capacity. The 2.5-gallon cylinder can discharge a strong stream of water for 55 seconds, which should be plenty to put out even large fires. Due to this aspect, it is often recommended for beginner users, as those 55 seconds give a lot of room for error. That said, the 240 is also very often used by professional firefighters precisely because of its large size. The range of the 240 should put you right out of harm’s way when fighting a fire, with a 45-55 feet initial discharge. Sustained discharge can extend this, and naturally as the pressure lowers the range will also decrease when you’re close to running dry. The product ships with a mounting bracket in the package. The cylinder itself will be empty, since transporting high-pressure objects like this would be extremely perilous, meaning you’ll need to fill it up yourself once you get it. That said, this also means that it is fully rechargeable, so you won’t be tossing it after use. You don’t need to take it to a gas-station or even fire station to do this. You can just fill it up with water and use a regular bicycle pump to get it back into working order. The valves on the 240 are made entirely out of metal making it a really sturdy extinguisher, and the safety pin is large enough to be easily removed in the heat of the moment should disaster strike. If you’re looking for a device that’s specifically designed for class A fires and don’t require the versatility of hybrid or universal extinguishers, the Amerex 240 is a perfect choice. It reigns supreme among specialized class A extinguishers with its massive capacity. When you’re picking from our list of extinguishers, it is important to keep in mind what role you want the extinguisher to fill. It’s easy to assume that this is a simple case of “ABC extinguishers are always better”, but like we highlighted in the reviews, the dry chemicals used by universal extinguishers have some harmful properties, meaning you might want a BC hybrid device if you’re looking to equip your car with an extinguisher. Getting the right device for the right situation is crucial, though it is always a good idea to keep at least one universal extinguisher in your home at all times.